This entry was posted on March 29, 2019 at 3:22 am and is filed under absurdities, advertising, bizarre, Brilliant but twisted, commercials, fantasy, humor, television, twisted reality. You can subscribe via RSS 2.0 feed to this post's comments. It would be a really messy crime scene, too…syrup everywhere! 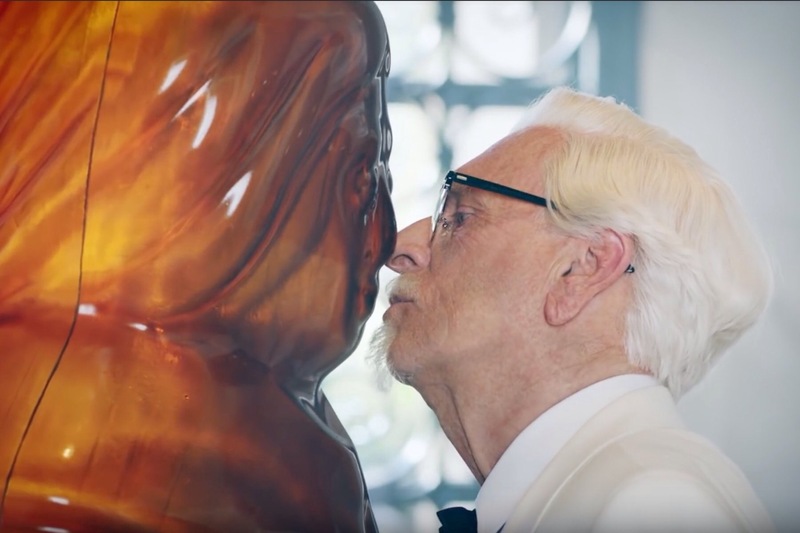 It seems to be the intent of many advertisers to make their commercials memorably bizarre, and the Colonel has really gone off into left field with him as RoboColonel and now Mrs. Butterworth’s lover. Funny, and with a touch of creepy! And, given that Reba McIntyre was successfully made to look like Colonel Sanders in a previous commercial for KFC, one has to wonder if that’s Jennifer “Baby” Gray under all that male drag? All I know is that Colonel Harland David Sanders is probably spinning in his grave for what has been done to his image and likeness in recent times. (Memo to myself: never become a corporate symbol or icon! You won’t be allowed to rest in peace or dignity. ).